Listings of high school yearbooks for SHS can be found below. You will find former students who are seeking yearbooks, those looking to sell a yearbook and general yearbook requests among the Slidell yearbook listings. This yearbook section was created to help alumni post yearbook classifieds. If you are an alumn of Slidell HS you should register now in the alumni directory. We also encourage you to interact with the rest of the alumni on this site. You can find old friends, share photos and stay updated on the latest school news. Just looking for a 2006 yearbook. Looking for my senior year yearbook! It was possibly stolen! I never got a yearbook! 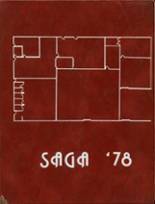 Anybody have the SAGA for 1977? I am looking for a yearbook for the school year 1975/1976. I would love to have our year book as my ex-boyfriend got rid of mine and would love to have the ones from 1975 and 1976 if at all possible. I lost my 1967 yearbook years ago. Looking to buy one. Contact me at *****@yahoo.com. Thanks. Since I only attended Slidell my senior year, 1966 is only year of interest. Would like to replace one.